Feeling the motion of the ocean is not to everyone’s taste. Thankfully, there are many innovative solutions to help ensure yacht stability. These three new superyacht stabilisation products each use a completely different method to make a yacht more stable: one is the most traditional, stabilising the yacht itself; another looks to stabilise surfaces within a yacht, so even a game of billiards will go off without a hitch; and the last product takes a completely unorthodox approach: instead of just making the yacht stable, it works on your body. The buzzword in superyacht stabilization is “zero-speed” – the art of stopping roll in a yacht when stationary, like in an anchorage. After all, who wants to wear their gazpacho or, worse, suffer the affliction of mal de mer when you should be enjoying the starlit view of a bay? While stabilisation has come a long way, the traditional slab-fin style has disadvantages – not least that the fins’ pivot point compromises efficiency while under way and at zero speed. These big appendages are also hugely detrimental for sailing yachts and pretty much useless for fast, planing yachts. Now, however, a new kid is on the block. The AntiRoll system from Dynamic Marine Systems draws its inspiration from nature. Dynamic Marine System realised that a whale-fin profile – long, curved and with a short cord length – could prove effective in underway and at-rest conditions, with around-axis rolling of the fin providing stabilisation underway, and up-down flapping providing far more effective leverage for stabilisation while at anchor. 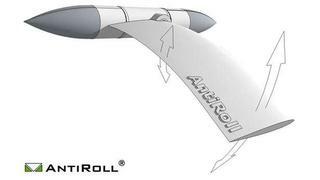 AntiRoll comprises a long, curved fin that promises two to three times greater efficiency in zero-speed mode, and 75 per cent less drag while under way – with the added advantage that the whole fin can fold flush into a shallow recess in the hull, which could prove very attractive to sailing yacht and planing yachts alike. It’s a very clever idea – the system won a Maritime Innovation Award – and Dynamic Marine Systems has already spoken with several leading superyacht yards. In fact, the system will be seen in action in 2015 for the first time on two yachts: a 37 metre in build at Wim Van der Valk in The Netherlands, and the 50-metre Feadship Endless Summer, where the system is being retrofitted. The story of Norwegian engineer Svend Heier’s Stable system is worth telling. He was asked, 15 years ago, to design a pool table that would work on a cruise ship. He succeeded and several were sold. But the system has far more interesting applications and his new Stable system is an extension of the original principle. What Heier has created is more than just a gyro-stabilised platform, on which objects or liquids would still be subject to the lateral forces imparted by a yacht’s motion. In his Stable system, accelerometers measure all the forces, and a computer controlled system delivers a counter force through the platform. The result is the surface stays level, balls don’t roll and liquid doesn’t move: it’s like dark magic when you see his demo rig in operation. Heier has already applied the system to onboard wine cellars and the like, and now proposes larger applications such as stabilised platforms for dining tables – or a pool table, perhaps. While other methods focus on stabilising a yacht, French clothing company Wear Is My Boat goes one step further and aims to stabilise and balance the body of the individual on board a yacht. Wear Is My Boat has, it claims, developed clothing that prevents seasickness. The key ingredient is a membrane printed with minerals. 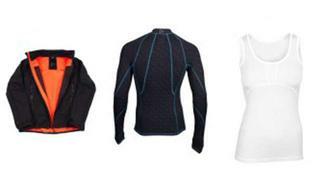 Available in leisure and sport ranges from €55 for a vest top to €191 for a sailing-orientated softshell jacket, you will at least get a nice top. Or a jacket. And if it works as promised, it’s a more cost-effective option than retrofitting stabilisers.